Good morning ladies and gentlemen and welcome to Max and Collin’s treemendously treerific parlour filled with only the most tantalising treets. True some have called it a pithy place inhabited by a branch of the family tree which is barking mad and ought to have been severed years ago, but those people are Max’s parents and so we pay them no heed whatsoever. You find us this morning still ferociously celebrating Wizmas and filled to the brim with maniacal cheer as we construct our Wizmas tree in the centre of the parlour. Long before Wiz defeated the Goddess, plants and trees that remained green all year had a special meaning for people in the winter. People believed that evergreens were the favoured plants of snow pixies, who brought gifts and granted wishes around the time of the Winter Solstice to cheer people up at the midpoint of the cold, dark season. They would bring an evergreen Tea Tree into the home and hang teacups and treats from its branches. Gaul is credited with starting the modern Wizmas tree tradition. In the 16th century, devout students from the collegiums of Munster brought nuts, bolts, wire and cogs into their dormitories and shaped them into pyramids resembling trees in an attempt to symbolise the evergreens of Siberia where Wiz is said to have defeated the Goddess. Tina Thrumler, wife of the 16th-century reformer Nathaniel Thrumler, first added lighted candles to a wizmas tree. Walking toward her home one winter evening, she was awed by the brilliance of stars twinkling amidst the pit heads of the local treacle mines. To recapture the scene for her family, he erected a tree from pistons and cogs in the main room and added candles to the tiers. To the Mor Ire Puritans Wizmas was sacred and this new custom of the Wizmas Tree seemed too much like the Tea Trees of old; Wizmas was a time for snow and sobriety, not prancing around the parlour. But the public persisted and in 1846, even Queen Victoria and Prince Albert, were sketched in the Illustrated Lichfield News standing with their extended family around a Wizmas tree, spoons in one hand and oat cakes in the other. Tea @Three: All Punked Up With No Place To Go? Good afternoon Ladies and Gentlemen! Welcome to Max and Collin’s frantically festive and perfectly punktastic parlour located in the splendidly scenic city of Lancaster, Mor Ire. True, perhaps, some have called it a cheerless crater blighting the landscape of an otherwise splendid panorama , but we consider that such people are merely embittered that they have not yet received an invitation. Or if you’re about in Nottingham there’s the very first ever Nottingham Steampunk Christmas market which is rather exciting and you could finish up by swinging The Pit and The Pendulum where their regular ‘Bitten By Fangs’ set should give you a seasonal chill! If you are the sort who finds themselves aimlessly wandering the weekday streets wondering where you are and what your name is or if you may have fallen through a worm hole and landed on the wrong patch ethereal of turf (we know that feeling well, you are not alone) you could do worse than pop along to The Yellow Book in Brighton, where they have Games Night, Laudanum and Lavender Open Mic, Pub Quiz and lots of lovely friendly staff with fabulous Steampunk Stories to tell you. 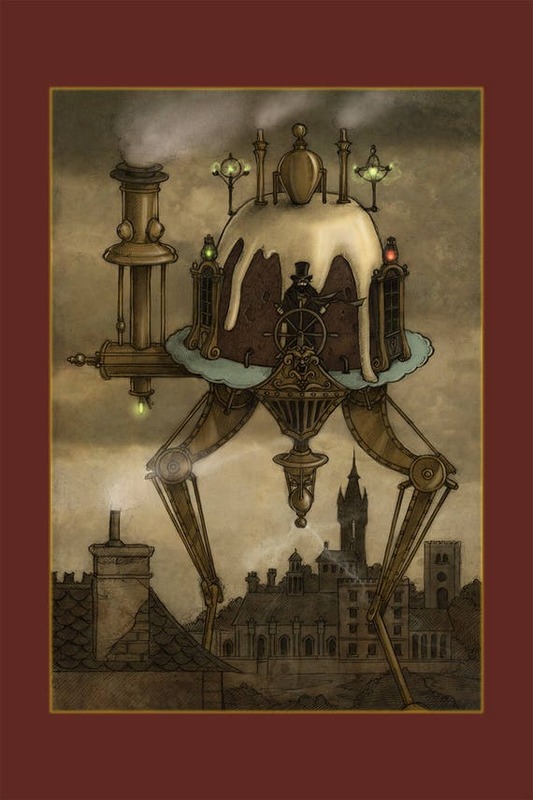 Or, looking further ahead, there’s the Walking in a steampunk wonderland on 17th dec in Newcastle Upon Tyne. So there is absolutely no excuse to be skulking around your parlour with so much festive fun to be had. We are in extreme haste this afternoon, being eager to don our hats and goggles and be off at once to watch the witches being pelted with hot plum pudding… not that we condone that sort of thing of course, nor will we derive any pleasure from it at all, but we must be seen to be fitting in with the festivities … you understand?… splendid, we knew you would! Soup of the day: Where’s the witch? Good morning! Albert Baker here, did you want some soup? You did? Well that’s fortunate isn’t it as this is a soup kitchen and… hic… sorry? You’re looking for my wife? A witch? Well how very dare you! Shhh! It is me Mrs Baker! I have cunningly disguised myself as my husband Albert in an attempt to hide from the good folk until these witch hunts are over. Blessings on your brew my dears…er….I mean, Thankyou come again…. hic…. Tea @ Three: All punked up with no place to go? Good morning Ladies and Gentlemen! Welcome to Max and Collin’s perfectly punktastic parlour located in the splendidly scenic city of Lancaster, Mor Ire. “December was gifted to us by The Powers That Tea, so that we might have a month in which it is perfectly acceptable to combine alcohol and tea. In December we stoke our inner flame with the warming spices of masala chai and remember that our actions in the world can bring this warmth and comfort to others. The Sacred Tea for December is Masala Chai.